Like the compressor in an electric vapor compression cycle, the absorption system uses its “thermal” compressor (consisting of the generator, absorber, pump and heat exchanger) to boil water vapor (refrigerant) out of a lithium bromide/water solution and compress the refrigerant vapor to a higher pressure. Increasing the refrigerant pressure also increases its condensing temperature. The refrigerant vapor condenses to a liquid at this higher pressure and temperature. Because this condensing temperature is hotter than the ambient temperature, heat moves from the condenser to the ambient air and is rejected. The high-pressure liquid then passes through a throttling valve that reduces its pressure. Reducing its pressure also reduces its boiling point temperature. The low-pressure liquid then passes into the evaporator and is boiled at this lower temperature and pressure. 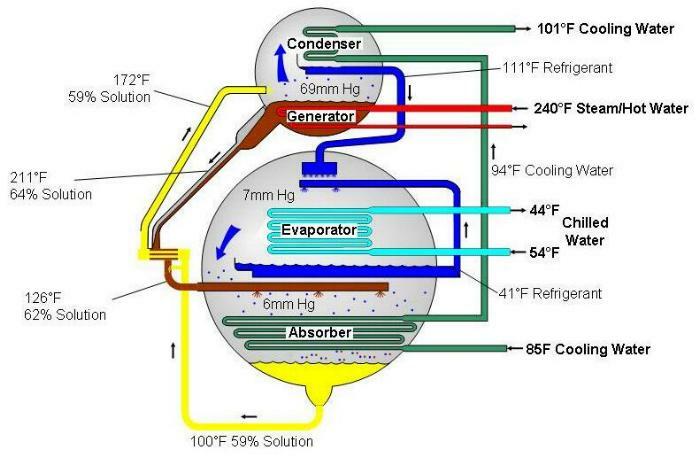 Because the boiling temperature is now lower than the temperature of the conditioned air, heat moves from the conditioned air stream into the evaporator and causes this liquid to boil. Removing heat from the air in this manner causes the air to be cooled. The refrigerant vapor then passes into the absorber where it returns to a liquid state as it is pulled into the lithium bromide solution (the absorption process). The diluted lithium bromide solution is pumped back to the generator. Because lithium bromide (the absorbent) does not boil, water (the refrigerant) is easily separated by adding heat. The resultant water vapor passes into the condenser, the absorbent solution returns to the absorber, and the process repeats. Although the process is similar to conventional electric vapor compression systems, absorption cooling substitutes a generator and absorber, called a thermal compressor, for an electric compressor. Efficiency and lower operating costs are achieved through the use of a pump rather than a compressor and a heat exchanger to recover and supply heat to the generator. Double-effect absorption cooling adds a second generator and condenser to increase the refrigerant flow, and therefore the cooling effect, for a fraction of the heat input of a single-effect system.